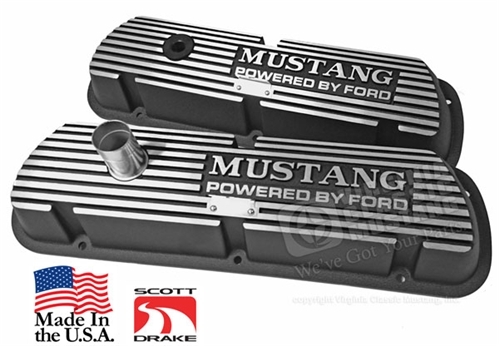 Highest quality valve covers available today. Made with pride in the USA and feature die-cast aluminum construction with integrated heat-sink fins for years of lasting performance. The authentic design of these valve covers has squared off bolt access ports modeled after original cast valve Shelby covers from the 60’s. They also feature Scott Drake’s low profile baffles providing maximum clearance for high lift cams and most aftermarket roller rocker arms. Spark plug wire loom brackets and PCV grommet are included. Will not fit 5.0L EFI engines.